As a person working in the IT field, I just can't make it without an IT based post once in a while. This time I am going to write about most often used applications today. I think it's safe to say those are Web browsing applications. I have been using such applications for quite a while and have tried many of them in the process. My first contact with internet was with a help of Netscape. I liked it, but over the years it has fallen behind in its ability to properly display more complicated web pages. Microsoft Internet Explorer took advantage of that and soon became the most popular web browser by far. It took other players some years to recover from that. Opera and Mozilla Firefox were amongst the most successful ones. For a limited period of time compared to Firefox and IE, Opera has had more advanced features. Soon Firefox took off on the wings of its many plugins and almost 100% accurate display of web pages. The advantage of Firefox is in its simplicity and consequential speed. Almost every functionality you can think of, can be included additionally in the form of an add-on. Recently Microsoft has released a new version of IE, which has simply copied many of the Firefox's proven functionalities. As a response to that Firefox 2.0 has been released. If you ask me, currently it's the best web browsing tool out there. It costs you absolutely nothing to try it out, but could gain a lot. It's faster then the competition, safer from spyware than IE, comes with a Google toolbar and thousands of various add-ons, which help you to make it your own. You can try it by clicking on the Firefox link in the right frame. 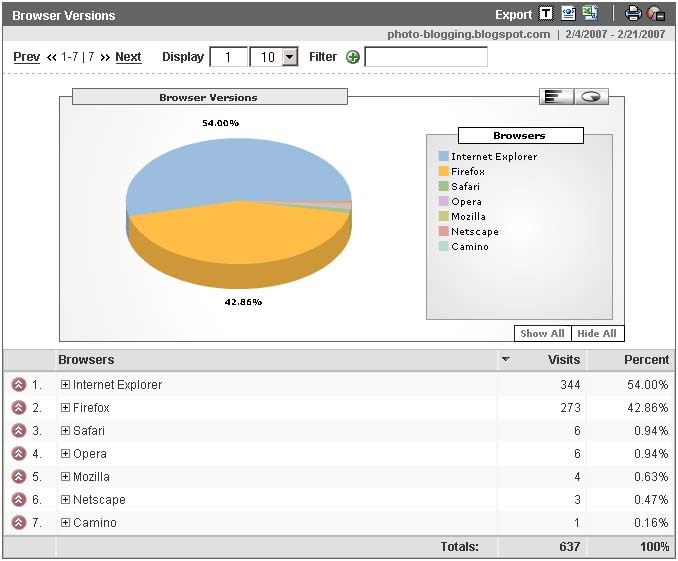 Below you can see a screenshot of most used web browsers by visitors of this photo blog. The screenshot was taken in Google Analytics. Global statistics at OneStat.com show that in July 2006 83.05% of all web surfers were still using Microsoft IE. Mozilla Firefox was used by only 12.93%, but its share is growing every day. Other followers are Apple Safari, Opera and Netscape with 2 percent and less. You can find the link to downloading the latest version of Mozzila Firefox in the right frame. Be one of the smart ones and use Firefox 2.0 to surf the web!